I am writing this to tell you how much we love Bianca. We got her in October and she was 9 weeks old. She has been the sweetest, most loving cat I have ever owned. She loves our entire family, which includes 2 dogs, another cat, twin 4 yr. old boys and a 9 year old girl. 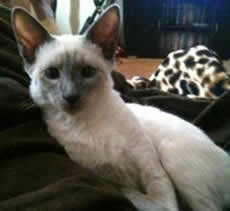 Her temperament is so amazing, everyone who meets her says that she is the sweetest cat they have ever met. If there is a lap vacant, she is on it. 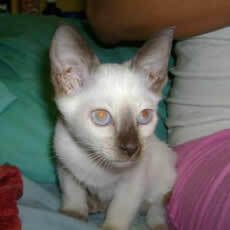 Mi Cattery does a phenomenal job of insuring the cats are breed for personality, and it shows. 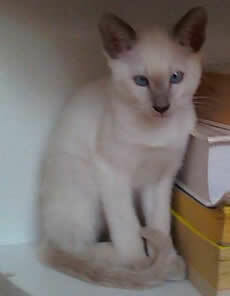 The pictures hardly do her sparkly blue eyes justice either! She is a beauty. I cannot possibly say enough about our sweet little girl! 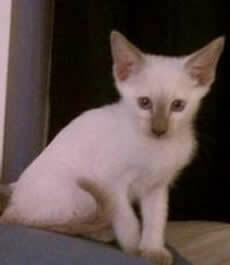 Just thought I'd send some pictures of the kitten I got in November, his name is Casper. He's been very loving, vocal and cuddly I couldn't ask for more. Django, our handsome little Blue brings us as much daily joy as that of his Seal half sister, Shasta. Honey, as always, we are beyond grateful to you for bringing these wonderful cats into the world and our lives. 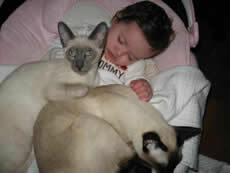 As you can see, there is total harmony and love between all felines and humans, including our smallest! Looking forward to our third MiCattery meezer at the end of this year! I am so in love with our kitten! We have named her Jada. She has made her self completely at home here. She romps and plays and then takes her naps and repeats. She is excellent with her litter! She's a great little joy and has made us smile so much. Just wanted you to know she is doing well. Sending affection to you and your family and also to ChingaLing and Major and all her kitty family. Here are two pics of my "baby", Mr. Lee. He was neutered on Tuesday. He's doing great and such a good boy. 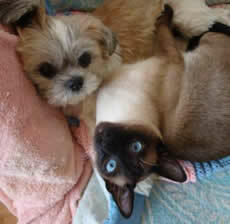 As you can see he's still best friends with my Shih Tzu! Thank you for such a beautiful boy! Here are some photos of Noodles. I can't believe he's 2 years old already. We love him so much. He has such a beautiful fun personality and is a delight in our lives - always a good boy. We've had him neutered so we can add a female addition to our family now. 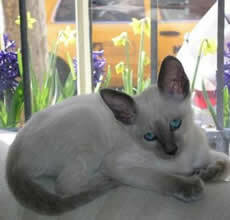 Sal and I are looking forward to getting a blue or preferably a lilac apple head female from you. We decided to name the baby Simon - the name sorta goes well with the cute little fluff-ball character that he is. He was naturally a bit scared in the cab to the train station, but then I noticed him playing with the pillowcase I left for him in his carrier when we were on the train back to city. We followed your advice and left him in the carrier when we got home in order to allow Maxwell to sniff and investigate. Needless to say, Max was not a happy kitty camperToday, however, we allowed them to physically meet one another and they've been playing and chasing each other since. We have no doubts that they'll be the best of friends and wonderful brothers when given a little more time to adjust. Simon is so cute and sweet - we couldn't be happier with our new family addition. My wife and I just wanted to drop an email to thank you again for our cute kitty "Sissy" (born 5/18/2010). I've included a couple of picturess; one of her playing with her favorite pink mouse (she carries it wherever she goes) and another shot of her begging for the attention of our older cat "Star. 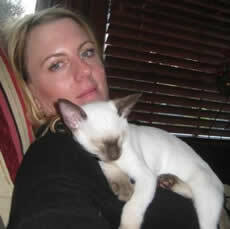 Also attached is a picture of Simon with Star. 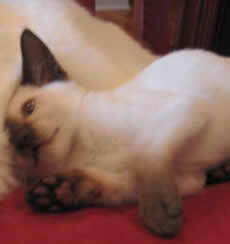 Simon is a blue point male we got from you 12 years ago who recently passed away. He was like no other cat we ever knew, such an amazing personality! He became such a good friend, and we miss him so much! When it came time to fill the hole in our hearts we knew you were the one to visit, and every day Sissy makes us smile and takes some of the pain away. 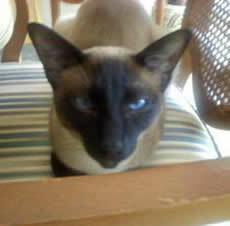 We continue to get to know our wonderful and much loved kitty. It is a process as she is a character! She has the silkiest fur I've ever felt - more like a bunny. She is an AMAZING athlete! You can see the muscles rippling under her fur. She makes these stunning leaps with height to spare, she is so strong. She is quite determined to do what she wants to do. We are training her in a patient and consistent manner, because we all are crazy about her. It's clear she is going to be a gorgeous cat. She has two speeds - lightening fast and fully relaxed and asleep to the point of her head falling backward, which is quite endearing. Thank you for producing this wonderful creature, Honey! She lights up our lives every day! We all love her to death. This is our second kitty from you and we are so pleased. She is healthy, alert, playful and so smart. Once again, thank you for such a great kitten.